Current WBO welterweight champion Manny Pacquiao is set to face the Australian contender Jeff Horn on April 22, 2017. The venue was not yet confirmed but it is possible to be play in Australia or UAE. Pacquiao vs Horn was confirmed by Dan Rafael of ESPN. “He (Arum) said the fight likely will take place in Australia or in the United Arab Emirates (Dubai or Abu Dhabi),” Rafael wrote in his ESPN report. Manny Pacquiao with the record of 59 wins (38KO) with 6 losses and 2 draws is already 38 years old but still wants to fight to defend his belt. 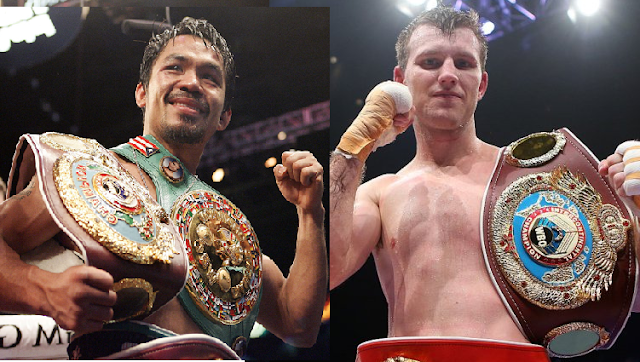 Pacquiao the only 8 division world champion will probably the better of two, base of the experince, but the youthness of Jeff Horn will also be the advantage for the Australian. Jeff Horn with his young boxing career of 16W(11KO)-0L-1D will earn more than 10x from his last fight. Jeff Horn is currently ranked no. 13th by boxrec in the welterweight division, he is also a knockout artist defeated his last 3 fights via emphatic stoppages. “It’s my time. I’m getting Pacquiao at the right moment. “I know I have the power to hurt him. If I land a clean shot on Pacquiao when he’s coming forward I know I could hurt him. That’s what I’m hoping for to catch him as he rushes in.’’ - he ended. Aside from that this will be the biggest event in Australian boxing history.